For the first time, researchers have observed a stellar jet being produced by a massive young galaxy outside the Milky Way. The jet is quite thin and stretches in two directions for almost 33 light-years. These kinds of jets are seen in several small young stars and occasionally some larger objects, but never has one been seen beyond our galaxy in visible light. The discovery is reported in Nature. The incredible phenomenon was spotted in the Large Magellanic Cloud, the biggest of the dozen companion galaxies that orbit the Milky Way. The star producing it is part of N180 B, a key H II (pronounced “H two”) region. These regions are extremely important, they are rich in ionized hydrogen and are stellar nurseries, where new stars are born. These new stars are responsible for the ionization of the gas, which carved the giant bubbles we see in the interstellar cloud. 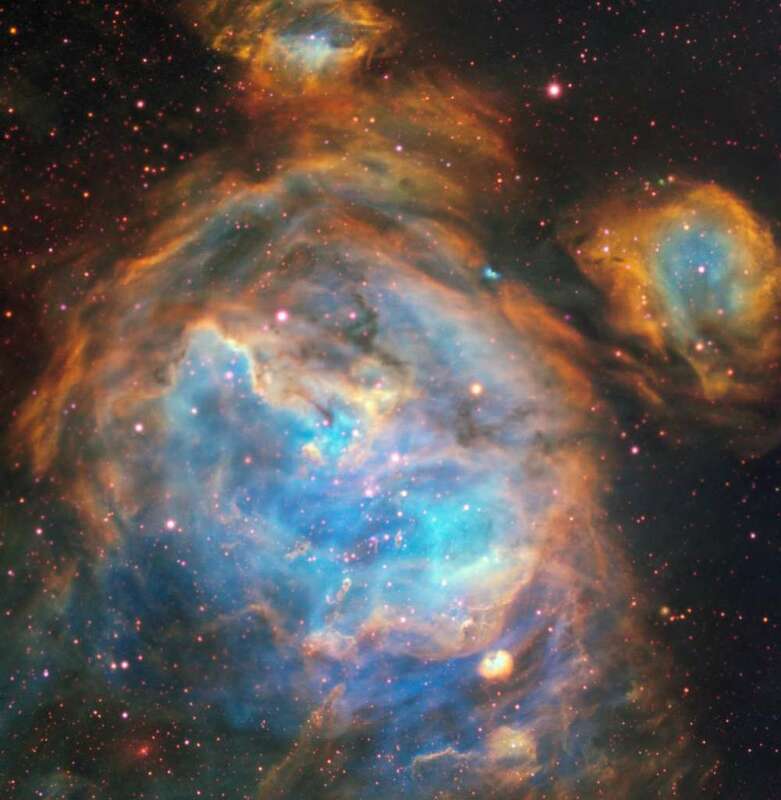 This dazzling region of newly forming stars in the Large Magellanic Cloud. ESO, A McLeod et al. The observations were possible thanks to the incredibly sharp eye of the Multi Unit Spectroscopic Explorer instrument (MUSE) on ESO’s Very Large Telescope. MUSE saw deep within the large bubbles of the nebula, spotting both the baby star and its huge jet. The jet is known in technical terms as a Herbig-Haro object and has been given the designation of HH 1177. It is produced by a star 12 times more massive than our Sun. HH 1177 is also one of the longest of these jets ever to have been observed. As the jet is collimated (it doesn’t spread out as it travels), it provides more evidence that the jets from massive stars behave just like the tightly collimated jets from low-mass stars. These jets are formed when a star continues to be fed gas and material from the disk that surrounds it. Plasma is then ejected into two jets along the axis of rotation of the star. Most jets are about a parsec (3.2 light-years) in length, so the team imagine this to be a scaled-up version of what happens in low-mass stars. This discovery not only gives us new insights into the lives of very young stars, but also strongly suggests that the physics underpinning the formation of heavy stars and young stars is likely to be very similar.